This cruise was already booked before we sailed in the summer on Nieuw Amsterdam in Alaska. After a disappointing first experience of HAL we tried to remain positive and not join the ship with any pre determined expectations. However after just a couple of hours onboard we realised the Eurodam is very much the twin sister with little obvious differences. We had been booked to embark at 1pm and we arrived on time and flew through embarkation. Excited to try the mariner lunch experience we headed straight to the dining room only to be told it had finished at 1pm! So why book our arrival after it had finished. Not the best of beginnings. We took hand luggage to the cabin ... second disappointment ... it was pretty much exactly how we remembered the balcony stateroom on NA ... complete with the darkened tinted mirrors. It makes the cabin dull and depressing .. along with the outdated decor and dark wood. The narrow corridor between the bathroom and the wardrobes made unpacking a nightmare and opening the bathroom door a problem. We tried not to let all this dampen our excitement of starting a cruise and went to get lunch in the buffet. Little change here too. Oh dear ... it&apos;s all starting to slip down hill and we haven&apos;t even left port. We opted for a simple salad ... served as usual ... not self serve .. please not too much dressing ... ooops too late! Please don&apos;t mix ... ooops too late! Mental note.. don&apos;t ask for any dressing. Outside eating is our preference but one whole side is given over to smokers so that limits tables available as often passengers choose to linger long after they have finished eating. We did manage to find two seats but the table had not been cleaned there was food on the floor, the windows were dirty and the small shelf next to me was needing a good clean too. Still not left port! No cutlery .. no glasses ... no napkins ... after a frustrating 10 minutes we finally managed to sit and eat our soggy salads. There must be other choices ... but .. we had forgotten how quick those blinds drop!!! Hey .. this was New Years Eve ... we weren&apos;t going to get disheartened. Let&apos;s get on with the unpacking and enjoy the sail away. Back to our cabin .. some cases get unpacked and then it&apos;s time to go to the safety drill, again held on the pronpmenade deck. Cabins are called and names ticked off but in the chaos it&apos;s hard to think it&apos;s an accurate account of the passengers on the ship. Our officers hadn&apos;t finished the list when the captains message was played and once it had finished everyone left. I doubt they had completed the roll call. HAL do it different to other lines we have used where we have sat in comfort and been accounted for by scanning our cruise card .. seems to be better than a loud hailer on deck but it&apos;s a drill and we won&apos;t have to do it again next weekend for the second week we keep telling ourselves. We opt to book Tamarind for our evening meal so we can eat late and not be left with too many hours before midnight. The meal goes well .. the restaurant and bar our favourite area on the ship. New Year was mainly celebrated on deck around the lido pool with singing and dancing. Other areas seemed relatively quiet. We made it to midnight .. just. After a long day travelling all we really wanted was a good nights sleep. Going back to the cabin at night is worse than during the day. Most cabins on ships appear welcoming with bed side lights but ours appeared dark and gloomy with bright led reading spotlights pearcing the darkness. We had bought Christmas lights with us from our rented villa in Florida and for a few days these helped to cheer up the cabin. When we took them down as usual on 12th night the cabin felt really gloomy. The dark green sofa and dark wood and tinted mirrors just depressing. The cabin quickly got nicknamed &apos;the cave&apos;. The AC unit was noisy and over the bed. No controls to adjust them fan speed or switch off. The only improvement from the last cruise was the modern flat screen TV wall mounted opposite the bed and the USB outlets that made charging phones and iPads easy. Since coming back home we have checked back on our photos from other cruises just to confirm we hadn&apos;t imagined how different the cabins looked. Apart from the occasional celebration splurge on a suite we have opted for balcony grades for all our other 40+ cruises. Princess,P&O, Cunard and Celebrity all have inviting decor and luxurious touches. That was the main thing we felt was missing not just in our cabin but through out the ship. Touches of luxury .. the 5 star feeling. It all felt dated and basic .. practical rather than luxurious. The upper level in the dining room had a horrible dark grey ceiling effect ... black lacquered chairs and dull colours. Corridors were carpeted in the main with clashing purple and red carpet designs and the theme followed through in most public area. The worst area was where the classical orchestra played in the evening .. greys ... just the most dowdy boring colour scheme imaginable. Perhaps the designer didn&apos;t want to distract the muscicians. It worked! Hard backed chairs ensured the audience remained attentive. In general the entertainment was way below average ... shows were well past the sell by date. Singers and dancers not much better than school productions. Reminded us of years gone by ... shows in general have come a long way since then. There is no self laundry .. not even a safe ironing room. Again struggling to think of any other cruise ship we have sailed that didn&apos;t have full laundry facilities. Cunard .. even free laundry powder for the machines. No one wants to spend hours doing laundry but somewhere to iron a shirt would at least be acceptable. The library is not staffed but the selection of books ok and the internet area light and open. There is no dedicated coffee lounge onboard but you can buy coffee here in this area alongside The Crows Nest bar at the top front of the ship. A pleasant area to sit and chat and enjoy Happy Hour at 4pm and later at around 9.30 ish. A good selection of free films available to watch on the modern flat screen TV ... which given the entertainment was our saving grace. Pity that it put us back in the &apos;cave&apos;. The cinema room often played the same films so wise to check ahead and see what&apos;s coming up. We had opted for anytime dining but that turned out to be long queues after 7.30 .. the only anytime really being early or late. So instead we switched to the upper fixed dining level preferring to at least wait in comfort on chairs near the entrance until the head waiter found us an empty table for that evening. It did feel a bit like waiting on the naughty seats but better than standing downstairs. The second week we had a fixed table allocated to us so much better although waiter service was stretched and slow. The food quality was good and meals presented well but after a couple of nights we preferred to eat in the speciality restaurants at a time that suited us. Canaletto was average and the main course served over salted .. the chef came out to apologise .. but we were still charged. Tamarind varied .. but usually good. Pinnacle restaurant excellent but at an extra $50 dollars it should have been. We were seated next to a party of 10/12 which was far from relaxing. No intimate dinner for two that night. We tried the evening buffet and were surprised that the food was so good. Just the same hassle of getting up and down .. waiting in lines ... etc etc. Not really cruise luxury .. more like a night at the canteen when working. Had we have had the option to cancel the second week and stay in Fort Lauderdale we would have jumped at it and that was before we knew what the weather held in store. We had force 10 gale conditions. Decks closed for safety reasons so more time spent in the cave watching films. A port stop cancelled. An extra day confined indooors Think it&apos;s quite apparent from the length of this review this was our least favourite ship/cruise line and when chatting to other passengers it was apparent that many who had ventured further afield than HAL felt the same. However what is also very apparent is that HAL has many loyal passengers. Who no doubt are feeling this is not a true reflection of the ship. Apologies to them. However it is our personal review and after meeting such nice people on board who hold the ship in such fondness we realise the company must do something right. We just didn&apos;t find it. Our account was totally messed up and debited and credited in a random fashion resulting in pages of repeat invoicing. When we printed our account from the nachine it just kept sending out sheet after sheet. It finally got corrected but only after numerous trips to the front office. Seemed even the smallest error had to be corrected by the most senior staff and that took days. I doubt we will look at further sailings with HAL .. we have encountered new friends ... but the cruise industry is a large one .. just so many ships that seem to offer a true luxury experience. This cruise was already booked before we sailed in the summer on Nieuw Amsterdam in Alaska. After a disappointing first experience of HAL we tried to remain positive and not join the ship with any pre determined expectations. However after just a couple of hours onboard we realised the Eurodam is very much the twin sister with little obvious differences. We had been booked to embark at 1pm and we arrived on time and flew through embarkation. Excited to try the mariner lunch experience we headed straight to the dining room only to be told it had finished at 1pm! So why book our arrival after it had finished. Not the best of beginnings. We took hand luggage to the cabin ... second disappointment ... it was pretty much exactly how we remembered the balcony stateroom on NA ... complete with the darkened tinted mirrors. It makes the cabin dull and depressing .. along with the outdated decor and dark wood. The narrow corridor between the bathroom and the wardrobes made unpacking a nightmare and opening the bathroom door a problem. We tried not to let all this dampen our excitement of starting a cruise and went to get lunch in the buffet. Little change here too. Oh dear ... it&apos;s all starting to slip down hill and we haven&apos;t even left port. We opted for a simple salad ... served as usual ... not self serve .. please not too much dressing ... ooops too late! Please don&apos;t mix ... ooops too late! Mental note.. don&apos;t ask for any dressing. Outside eating is our preference but one whole side is given over to smokers so that limits tables available as often passengers choose to linger long after they have finished eating. We did manage to find two seats but the table had not been cleaned there was food on the floor, the windows were dirty and the small shelf next to me was needing a good clean too. Still not left port! No cutlery .. no glasses ... no napkins ... after a frustrating 10 minutes we finally managed to sit and eat our soggy salads. There must be other choices ... but .. we had forgotten how quick those blinds drop!!! Hey .. this was New Years Eve ... we weren&apos;t going to get disheartened. Let&apos;s get on with the unpacking and enjoy the sail away. Back to our cabin .. some cases get unpacked and then it&apos;s time to go to the safety drill, again held on the pronpmenade deck. Cabins are called and names ticked off but in the chaos it&apos;s hard to think it&apos;s an accurate account of the passengers on the ship. Our officers hadn&apos;t finished the list when the captains message was played and once it had finished everyone left. I doubt they had completed the roll call. HAL do it different to other lines we have used where we have sat in comfort and been accounted for by scanning our cruise card .. seems to be better than a loud hailer on deck but it&apos;s a drill and we won&apos;t have to do it again next weekend for the second week we keep telling ourselves. We opt to book Tamarind for our evening meal so we can eat late and not be left with too many hours before midnight. The meal goes well .. the restaurant and bar our favourite area on the ship. New Year was mainly celebrated on deck around the lido pool with singing and dancing. Other areas seemed relatively quiet. We made it to midnight .. just. After a long day travelling all we really wanted was a good nights sleep. Going back to the cabin at night is worse than during the day. Most cabins on ships appear welcoming with bed side lights but ours appeared dark and gloomy with bright led reading spotlights pearcing the darkness. We had bought Christmas lights with us from our rented villa in Florida and for a few days these helped to cheer up the cabin. When we took them down as usual on 12th night the cabin felt really gloomy. The dark green sofa and dark wood and tinted mirrors just depressing. The cabin quickly got nicknamed &apos;the cave&apos;. The AC unit was noisy and over the bed. No controls to adjust them fan speed or switch off. The only improvement from the last cruise was the modern flat screen TV wall mounted opposite the bed and the USB outlets that made charging phones and iPads easy. Since coming back home we have checked back on our photos from other cruises just to confirm we hadn&apos;t imagined how different the cabins looked. Apart from the occasional celebration splurge on a suite we have opted for balcony grades for all our other 40+ cruises. 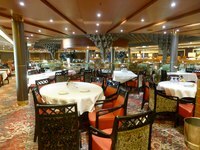 Princess,P&O, Cunard and Celebrity all have inviting decor and luxurious touches. That was the main thing we felt was missing not just in our cabin but through out the ship. Touches of luxury .. the 5 star feeling. It all felt dated and basic .. practical rather than luxurious. The upper level in the dining room had a horrible dark grey ceiling effect ... black lacquered chairs and dull colours. Corridors were carpeted in the main with clashing purple and red carpet designs and the theme followed through in most public area. The worst area was where the classical orchestra played in the evening .. greys ... just the most dowdy boring colour scheme imaginable. Perhaps the designer didn&apos;t want to distract the muscicians. It worked! Hard backed chairs ensured the audience remained attentive. In general the entertainment was way below average ... shows were well past the sell by date. Singers and dancers not much better than school productions. Reminded us of years gone by ... shows in general have come a long way since then. There is no self laundry .. not even a safe ironing room. Again struggling to think of any other cruise ship we have sailed that didn&apos;t have full laundry facilities. Cunard .. even free laundry powder for the machines. No one wants to spend hours doing laundry but somewhere to iron a shirt would at least be acceptable. The library is not staffed but the selection of books ok and the internet area light and open. There is no dedicated coffee lounge onboard but you can buy coffee here in this area alongside The Crows Nest bar at the top front of the ship. A pleasant area to sit and chat and enjoy Happy Hour at 4pm and later at around 9.30 ish. A good selection of free films available to watch on the modern flat screen TV ... which given the entertainment was our saving grace. Pity that it put us back in the &apos;cave&apos;. The cinema room often played the same films so wise to check ahead and see what&apos;s coming up. We had opted for anytime dining but that turned out to be long queues after 7.30 .. the only anytime really being early or late. So instead we switched to the upper fixed dining level preferring to at least wait in comfort on chairs near the entrance until the head waiter found us an empty table for that evening. It did feel a bit like waiting on the naughty seats but better than standing downstairs. The second week we had a fixed table allocated to us so much better although waiter service was stretched and slow. The food quality was good and meals presented well but after a couple of nights we preferred to eat in the speciality restaurants at a time that suited us. Canaletto was average and the main course served over salted .. the chef came out to apologise .. but we were still charged. Tamarind varied .. but usually good. Pinnacle restaurant excellent but at an extra $50 dollars it should have been. We were seated next to a party of 10/12 which was far from relaxing. No intimate dinner for two that night. We tried the evening buffet and were surprised that the food was so good. Just the same hassle of getting up and down .. waiting in lines ... etc etc. Not really cruise luxury .. more like a night at the canteen when working. Think it&apos;s quite apparent from the length of this review this was our least favourite ship/cruise line and when chatting to other passengers it was apparent that many who had ventured further afield than HAL felt the same. However what is also very apparent is that HAL has many loyal passengers. Who no doubt are feeling this is not a true reflection of the ship. Apologies to them. However it is our personal review and after meeting such nice people on board who hold the ship in such fondness we realise the company must do something right. We just didn&apos;t find it. Our account was totally messed up and debited and credited in a random fashion resulting in pages of repeat invoicing. When we printed our account from the nachine it just kept sending out sheet after sheet. It finally got corrected but only after numerous trips to the front office. Seemed even the smallest error had to be corrected by the most senior staff and that took days. I doubt we will look at further sailings with HAL .. we have encountered new friends ... but the cruise industry is a large one .. just so many ships that seem to offer a true luxury experience. Worst ... decor .. dark tinted mirrors .. dark interior wood .. dark green sofa .. black box as stool .. AC noisy and right above the bed. This was a purpose built resort for cruise ships. Never the less a pleasant day ashore. Very cheap mixers from shop after the pool area. 50 cent tonic water. Saw officers carrying carrier bags full back to ship. Great place to visit. Las olas interesting shopping and river walk area. A beach destination. Very little else. A lovely private beach area. Great sand .. great swimming. Stayed here before .. great place to visit . Pity we didn&apos;t sail after the amazing sunset. A great city stop. Two historic forts .. a nice walk between with a lunch stop. Black beards castle worth the uphill walk and 99 steps.